As we enter the final month of summer, many of you are either preparing to go back to school or helping your children get ready for the occasion. Unfortunately, this means back-to-school shopping, which can be a little hard on your wallet. Luckily, Weekends Only Furniture & Mattress has huge deals on bedroom and office furniture just for this occasion! Weekends Only Furniture & Mattress is offering online deals on bookshelves, writing desks, storage units, and other office furniture. 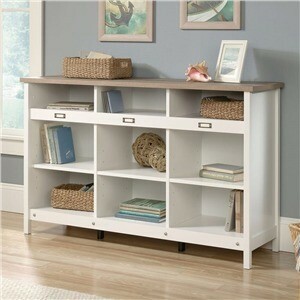 For example, check out this affordable collection from Sauder®. Many items are available at Weekends Only with over 30% savings on the market price, and many are available for the first time at Weekends Only. The Sauder Adept Cubbyhole Storage Credenza is a favorite among college students looking for a more sophisticated and organized feel than your standard dorm room hand-me-down. The Transit Rustic Industrial L-Shaped Desk, on the other hand, is ultra-modern with a minimalist design and lots of room to spread your work in front of you—the perfect choice for an art student. Moving off campus this semester? Upgrade from your dorm room, twin-sized mattress and check out Weekends Only Furniture & Mattress’s selection of bed frames. First time buying a bed? Read this helpful guide for purchasing a new mattress. To take advantage of these amazing office furniture deals, visit Weekends Only Furniture & Mattress online before Labor Day, September 5th. They offer delivery services to the St. Louis and Indianapolis metropolitan areas, and they even provide free furniture assembly services for certain items. You can also contact them at (855) 803-5888, or visit their Facebook, Twitter, Pinterest, and Instagram pages for home décor and interior design inspiration.